Are you looking for commercial air conditioning repair in North NJ? 1st Choice Plumbing, Heating & Drain Service specializes in commercial air conditioning repair in North NJ. As a fully insured, licensed and air conditioning company, we have the knowledge and expertise to efficiently repair the air conditioner in your office, warehouse or retail store. For more than 30 years, our professional and well-informed plumbers have repaired air conditioners for a variety of property managers and business owners, so you can be sure we will perform prompt and affordable repairs on your existing AC unit. If you suspect an issue, there are a few signs that may suggest your AC unit is in need of repair. Of course, if you are experiencing AC disruption or total failure of service, you are in need of commercial air conditioning repair. Likewise, odd noises and odors coming from the vents, or the AC unit itself, are never good signs. If you notice a water leak anywhere near the air conditioner unit, there could be a build up of condensation because of a broken drain tube. Inaccurate thermostats may also point to a malfunctioning AC. The most obvious sign you may need AC repair is limited air flow coming through the vents. Though these symptoms may seem insignificant, they can cause permanent damage to your commercial air conditioner if they are not fixed without delay. At 1st Choice Plumbing, Heating & Drain Service, we understand how important a properly functioning air conditioner is for your workplace - especially as temperatures begin rising. Air conditioners lower the temperature in the room and lower the temperature of the body. Without a working AC, employees body temperatures can rise and take a negative toll on their health. Additionally, hot and humid office environments affect your team's motivation and limit workflow. You deserve to work in a comfortable space. Having a functioning air conditioner in your workplace is vital to you and your employee’s health, as well as your businesses continued success. Our commercial air conditioning repair in North NJ is available 24 hours a day, seven days a week. 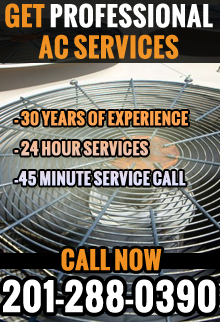 Our professional AC repair technicians understand that you never plan on your air conditioner to stop working. During these times, we are available with emergency commercial air conditioning repair service so that you can comfortably get back to work. If you notice that your AC unit isn't performing at optimal strength, or isn't functioning at all, don't panic! Our AC technicians make the necessary repairs and restore comfort to your workspace without delay. We have the skills, equipment, and efficiency to get your AC unit up-and-running again! For more information about commercial air conditioning repair in North NJ, contact 1st Choice Plumbing, Heating & Drain Service at 201-288-0390. 1st Choice Plumbing - Your trusted source for commercial air conditioning repair in North NJ.